The Year is Moving Fast. You Need to Move Faster. The Time To Act Is Now! All around you is opportunity and challenge. The only thing holding you back from the life you love is the POWER to achieve up to your full potential. Which is WHY we wrote the world’s first virtual personal book on performance excellence. You will answer 10 simple questions in 10 color-coded areas of your performance and we will give you the tools you need to move your success up to the fast track. This program is proven to work and guaranteed to work for you. We will help you see areas of your performance that need to be specifically addressed, so you can deal with them. You will also see precisely what you are doing right and where you can amplify your strengths even more. 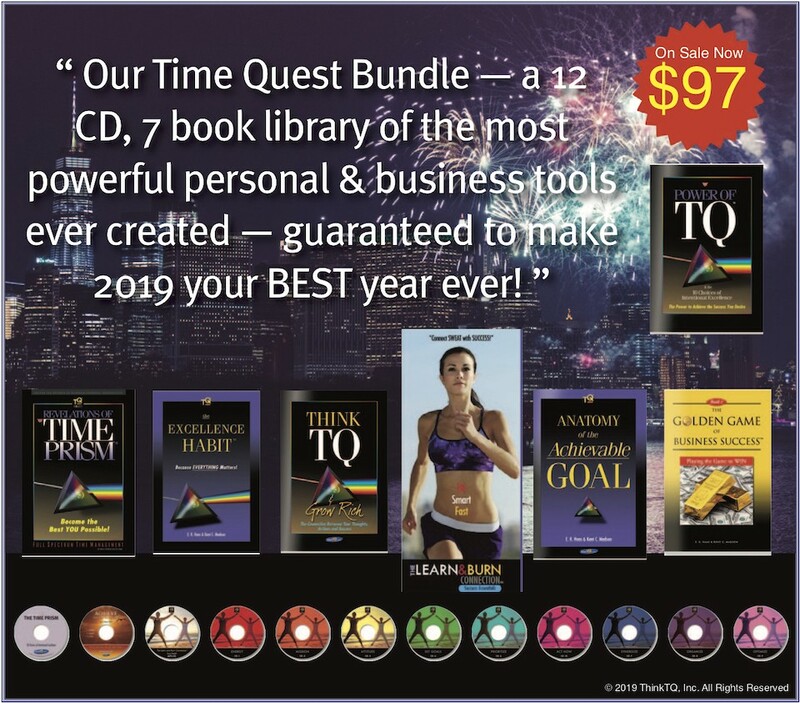 No risk — 100% guaranteed —25 years and millions of people transformed by TQ. Order now. This offer puts our most popular programs in your hands for just $97 — including everything you see above + more. We are in the greatest economy in decades. More Millionaires and Billionaires will be created this year than at any time in history. With desire, skill, and training, this can be you. Please feel free to look up the various products on our main site (ThinkTQ.com). If you purchased this bundle separately, your cost would be over $600. Other than including live coaching, this is a fabulous value at 3 times the price. I’ll even sign you up for 12 Live Quick Start Coaching Sessions! You now have no reason to wait, and every reason to step your game up a notch or two. Double your income… why not you? Increase your personal free time… why not you? Expand your business… why not you?